This is a much more informal post than those you usually see on Rewrite This Story but I really wanted to post about this as I'm so overwhelmed by the achievement. 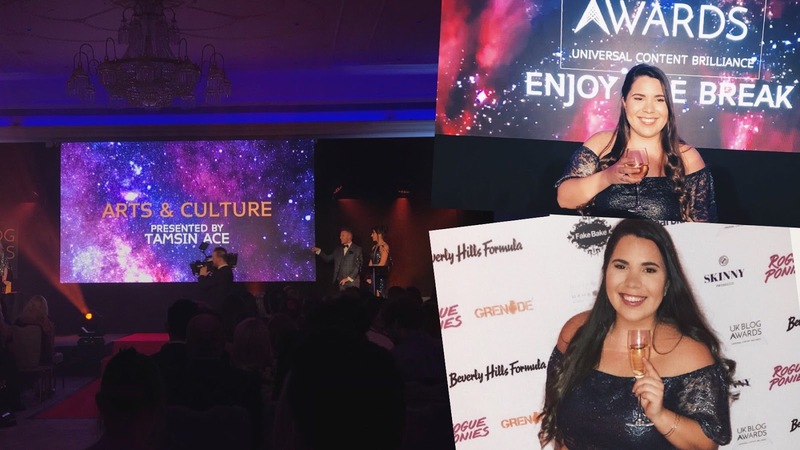 Last Friday at the Marriott Hotel, Grosvenor Square, Rewrite This Story was awarded the UK Blog Award in the Business Arts and Culture Category! Now when I say I didn't expect to win, I'm not just saying it to be humble. Although I think this site and all it's stageyness is wonderful, I really didn't think we had a chance against amazing blogs such as Ticketmaster, Heritage Daily (who won the highly commended award- congratulations!) and Eight Ray Music. But against all the odds- we won! I don't want to drag this out but I truly want to send my deepest thanks to everyone who is a part of this site. Firstly, thank you to our amazing reviewers! This site wouldn't work without you. Thanks to you guys we have consistent theatrical reviews, interviews, news and opinion pieces. Our reviewers range from age 14 all the way to 78 which is incredible and just proves how universal theatre is. Secondly, thank you to all the readers! Thank you for supporting us, continuing to read our posts, and commenting and interacting with Rewrite This Story on it's social platforms. Thank you for voting and supporting us. Also thank you to Head Judge Gina Akers and the Arts and Culture judge Tamsin Ace for believing in the blog enough to vote for us! Other than the feeling of watching a show, the joy of theatre is being able to share it with others and I am so happy that this site has become a hub for that. On a personal note I want to thank my family and friends for putting up with all my theatrical adventures and going on's. Although I now have an amazing team of reviewers who are extremely helpful and supportive, I started this site alone and it's taken a lot of graft to get to this point. There have been many emotional, stressed moments and I truly couldn't have gotten through it without my amazing support network. I've got to give my mum a special mention (not only because she'll be furious if I don't) she is my number one supporter and Rewrite This Story couldn't have got where it is without her. She contributes emotionally as well as reviewing on the site herself! Thanks mum! This award isn't just for this site though. This award is for the theatre community as a whole. I truly hope this is a step forward for us all and that it's an entry way for us to be a bigger part of the universal blogging community. Theatre bloggers really are a force to be reckoned with and I can't wait to see what we all achieve in the future! Thank you, thank you, thank you. The future is certainly stagey!